As technology continues to dominate our homes, new devices have become available to better our control on our environments. But what is a smart house, and what does it mean for the future of safety for our homes? What is a smart house? You’ve probably heard the term, and you might already have some smart devices at home, but what are the real benefits? A smart house is one installed with devices that allow you to control anything from the temperature of your rooms, to the temperature of your morning coffee. With the huge success and availability of smartphones and tablets, the range of smart home devices is ever expanding. From Amazon’s Echo to the Apple Homekit, these portable devices are internet connected and can be programmed to control a variety of functions throughout the house, either by connecting to a smart hub, or with individual products running independently from your phone or tablet. Here we look at the main benefits of having a smart house, and why they are the future of security for our homes. Having a smart house gives you the convenience of controlling your environment with one device. Most modern TVs and sound systems are smart enabled, and you can also use your smart devices to control lighting, heating, air conditioning and security camera systems, which can all be accessed remotely from any room or even away from home through an internet connection. The main benefit of a smart house is being able to check messages, operate lights, monitor safety and track spending, all through your smartphone and to your own schedule. Smart technology allows you to add products and devices at your own pace and budget, meaning you can build your smart house over time with little hassle. An emerging feature of having a smart home is the ability to conserve resources and monitor energy consumption. More and more people are becoming aware of the environmental benefits of using smart home technology, with smart home controllers having built-in monitoring systems that calculate usage of connected devices, keeping you aware of your costs. Most people are unaware of the true energy consumption of their homes, a smart house allows you to freely adjust your energy usage to your own needs, making your house modern, functional and green. 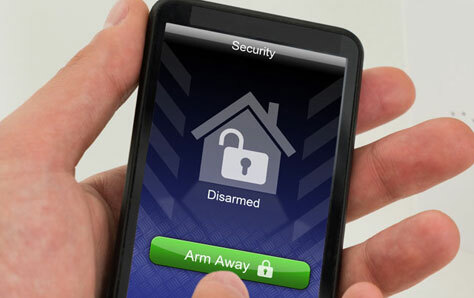 What is a smart house without security? Security is the key to having an intelligent home and smart houses offer enhanced protection for your property and belongings. From something as simple as turning lights on at night to make it look like people are home when you’re away, to CCTV with multiple cameras that record in HD, 24 hours a day and can be viewed by your mobile or tablet from anywhere in the world. Smart access control systems allow you to control security gates, door locks, and alarms and some systems even have the capability to send alerts to your phone if a fire alarm is triggered. With smart technology the options are endless when it comes to keeping tabs on what’s happening in your home. You can now have peace of mind at the touch of a button, making smart houses the future of home security. Having a smart house can present some very exciting opportunities to monitor and adjust the way you live and monitor your security. While a fully integrated smart security system should be planned during the early stages of a new build or renovation project, don’t worry if this doesn’t apply to you. You can still build a functioning smart home with excellent security features. At Matrix Fire and Security we install, monitor and maintain all types of security control systems. From stand alone coded keypads and fob reader units to fully integrated multi network systems, controlling numerous doors with swipe cards and biometric readers, we will be able to provide a system tailored to suit your requirements. Contact us and view our case studies. ← Why Is Corporate Security So Important?